Using population imaging and multilinear regression to describe feature responses across the Purkinje population during visuomotor behaviors. (a) Cartoon of the embedded zebrafish preparation under the two-photon microscope with freely-moving eyes and tail. (b) Overview of the visual stimuli presented to the awake, behaving zebrafish during volumetric two-photon calcium imaging. See Materials and methods for further details. The mean swimming activity and eye position for a representative fish across an entire experiment is shown (N = 100 trials). (c) Composite bright field image of a seven dpf zebrafish larva from a dorsal view showing Purkinje cells expressing GCaMP6s driven by a ca8 enhancer element. Scale bar = 100 microns. (d) Overview of the multilinear regression analysis. See Materials and methods for additional details and see Figure 1—figure supplement 1 for full list of regressors. (e) Left panels, example calcium signal from a Purkinje cell across two planes (black trace) can be well recapitulated through multilinear regression (MLR, grey trace; R2 = 0.77). The regressors with the seven largest coefficients (β) are shown below scaled in height and colored by their β value (blue = positive, red = negative). The asterisk for regressor four refers to a negative value of β which results in an inverted regressor. Right, a bar graph quantifying the normalized β values for all regressors for this cell with the regressors shown at left labelled. See also Figure 1—figure supplements 1 and 2. Functional imaging anatomy and full regressor list. (a) Single imaging planes showing PC:GCaMP6s fluorescence as obtained from confocal imaging (upper panel) and during two-photon experiments (middle panel). Lower panel, a single confocal imaging plane from a PC:NLS-GCaMP6s fish where GCaMP is restricted to the nucleus. Red arrowheads indicate example Purkinje cell somata. Scale car = 25 microns. (b) Quantification of Purkinje cells in the entire cerebellum at seven dpf as counted in the PC:NLS-GCaMP6s line. N = 3 fish. (c) The complete set of regressors used in analysis of calcium imaging data. Individual regressors fall into one of five categories (three sensory and two motor), as indicated by the categories at right. Tail and eye motor regressors are calculated for each imaging plane based on the motor activity during that trial, therefore a representative example from one trial in the dataset is shown here. See also Videos 1 and 2 for example imaging trials with the sequence of visual stimuli displayed. (d) Projections of the first ten principal components of Purkinje cell activity in response to experimental stimuli across all fish (N = 6; see Materials and methods), ordered in increasing variance explained. Components that show a high degree of anatomical clustering are colored. Colors are arbitrarily chosen. Calcium signals report complex spikes reliably but can also report simple spike bursts. (a) Example cell-attached electrophysiological recording (ephys, black trace) and simultaneously recorded fluorescence trace (green) from a Purkinje cell expressing GCaMP6s under the Purkinje cell-specific ca8 enhancer. All complex spikes (orange dots) are accompanied by an increase in fluorescence as shown as a deflection in the fluorescence trace that accounts for every peak in the complex spike regressor (orange trace, spike rate convolved with GCaMP kernel). In contrast, only high frequency bursts of simple spikes (blue dots) influence the fluorescence signal (indicated by blue arrowheads). (b) The mean spike-triggered fluorescence signal and standard deviation is plotted for the example cell from a) for complex and simple spike bursts (N = 25 each). (c) A composite epifluorescent image showing a bright field dorsal view of the cerebellum together with single-cell GCaMP expression in the Purkinje cell from the previous panels and the rhodamine-filled electrode contacting this cell. The outline and midline of the cerebellum is indicated by the dashed white line. Scale bar = 50 microns. (d) The mean spike-triggered fluorescence signal and standard error is plotted for eight cells (N = 6 fish) for complex and simple spike bursts. (e) The relative contribution of the complex spike (CS) and simple spike (SS) regressors (spike rates convolved with the GCaMP kernel) to the fluorescence signal in each cell as determined by least squares regression (see Materials and methods) across the eight cells. The example cell from a) is indicated. (f) The location of all example cells, color-coded by relative SS regressor contribution. (g) Overview of i) the morphology of a singly-labelled Purkinje cell and the subcellular regions of interest (ROIs) with ii) corresponding calcium signals obtained from high resolution two-photon imaging (see Materials and methods). Scale bars = 20 microns. 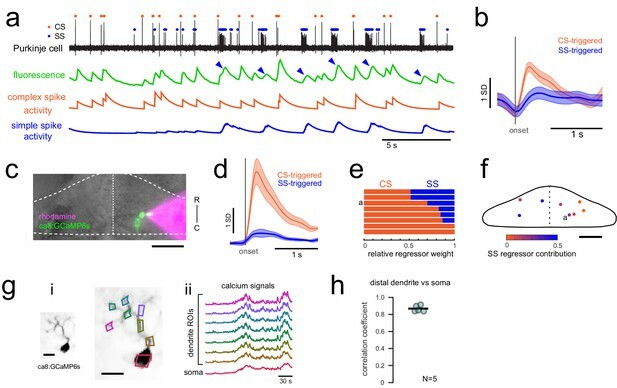 (h) Quantification of the correlation coefficient between the calcium signal from the most distal dendritic segment and the soma. N = 5 cells from three fish. Purkinje cell activity is functionally clustered across the cerebellum. (a) Heatmaps of the z-projected mean voxelwise correlation coefficients from multilinear regression (MLR) with example sensory and motor regressors for a representative fish (see Materials and methods). Scale bar = 50 microns. (b) Voxels from the example fish in a) are colored according to whether the best regressor for correlated sensory stimuli and motor events (including i) swimming and ii) eye movement) are sensory (magenta), motor (green), or equal/uncorrelated (white). (c) Left, quantification of principal component analysis, clustering, and stereotypy of Purkinje cell responses. Left axis, index values across the first ten principal components with respect to the anatomical clustering of principal components within a fish (red line) and the stereotypy of these clusters across fish (blue line). Dotted black line shows an index value of 1 (equivalent to chance). Right axis, total variance explained across principal components. Right panel, mean spatial mapping of the four principal components with the highest index values for anatomical clustering and stereotypy as individual maps (above) and composite (below). Colors are arbitrarily chosen. 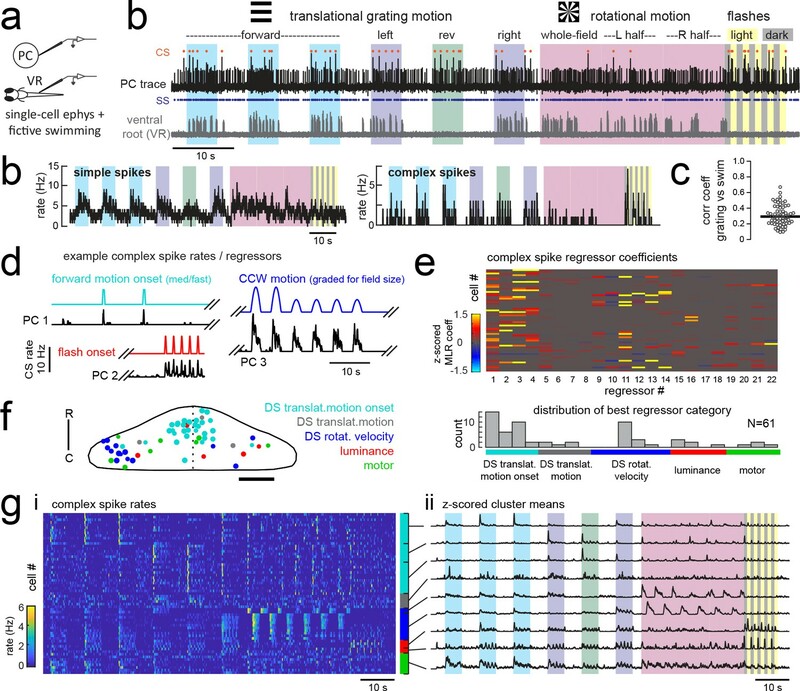 Electrophysiological recordings from Purkinje cells reveal distinct complex spike responses that can be grouped into four primary response types corresponding to sensory or motor features. 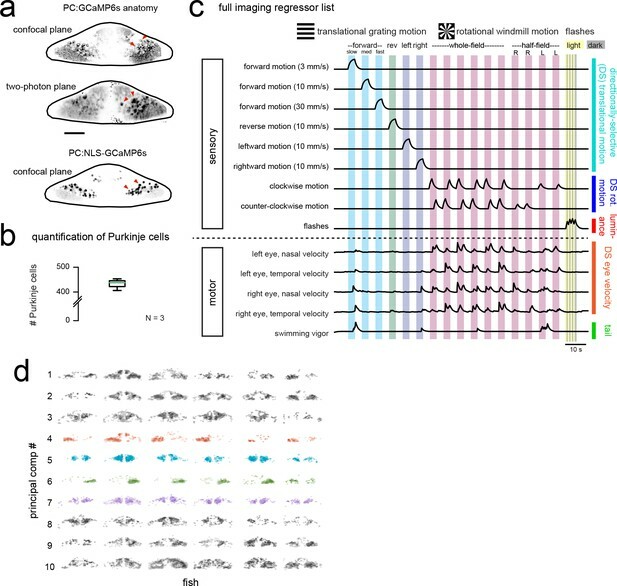 (a) Cartoon of the embedded, paralyzed zebrafish preparation used for simultaneous Purkinje cell (PC) electrophysiology with fictive swimming patterns extracted from the ventral root (VR). (b) Example single trial from a cell-attached Purkinje cell (PC) recording (upper trace, black) with simultaneous ventral root recording (lower trace, gray, shown as a moving standard deviation). Complex spikes in the PC are indicated by orange dots above the trace and simple spikes are indicated by blue dots below the trace. Stimuli are color-coded as before (see Figure 1 and Materials and methods for more details). (b) Left, the mean simple spike (SS) and complex spike (CS) rate for the cell shown in (a) across five trials. Right, the correlation coefficients of forward, left and rightward grating motion with the trial by trial fictive swim activity for all fish. (c) Plot of the correlation coefficient for each fish between the regressor for concatenated swimming activity during moving forward, left, and right gratings across all trials and the summed sensory regressor for forward, left, and right grating motion. The mean is indicated by the black bar. (d) Example mean complex spike rate extracts from three different Purkinje cells showing the temporal similarity of firing dynamics with visual feature regressors. (e) Above, heatmap of coefficient weights for the complex spike firing rates of 61 cells from z-scored least-squares multilinear regression (MLR) with a full set of 24 stimulus- and motor-related variables (see Materials and methods). Below, histogram showing the distribution of cells’ highest regressor weight. (f) Location of these cells across all fish mapped onto a reference cerebellum (dorsal view). The color indicates the highest MLR coefficient weight for that cell while the size indicates the degree to which that coefficient contributes to the overall firing rate respective to the others, where the biggest circles = 100%. Scale bar = 50 microns. (g) Left, heatmap of complex spike rates for all 61 cells clustered according to the category of their highest MLR coefficient weight (e.g. luminance, rotational motion, swimming). Colored bars at right indicate complex spike category as indicated in previous panels. Right, the mean z-scored complex spike rate from each cluster. See also Figure 3—figure supplements 1 and 2. Sensory and motor regressors used for multilinear least-squares regression with electrophysiological recordings Top left, cartoon of recording setup. Top center, description of stimuli used in the electrophysiological experiments (see Materials and methods and Figure 2 for details). Gratings speeds are 10 mm/s with additional slow (Fslow, 3 mm/s) and fast (Ffast, 30 mm/s) speeds for forward grating stimuli. The windmill stimulus rotated at sinusoidal velocities in the clockwise (CW) and counter-clockwise (CCW) directions with a frequency of 0.2 Hz. Six total periods were shown, with the first two periods being whole-field windmills, the second two periods restricted to the left visual field only, and the final two periods restricted to the right visual field only. Below, the complete set of regressors used in analysis of electrophysiological data. 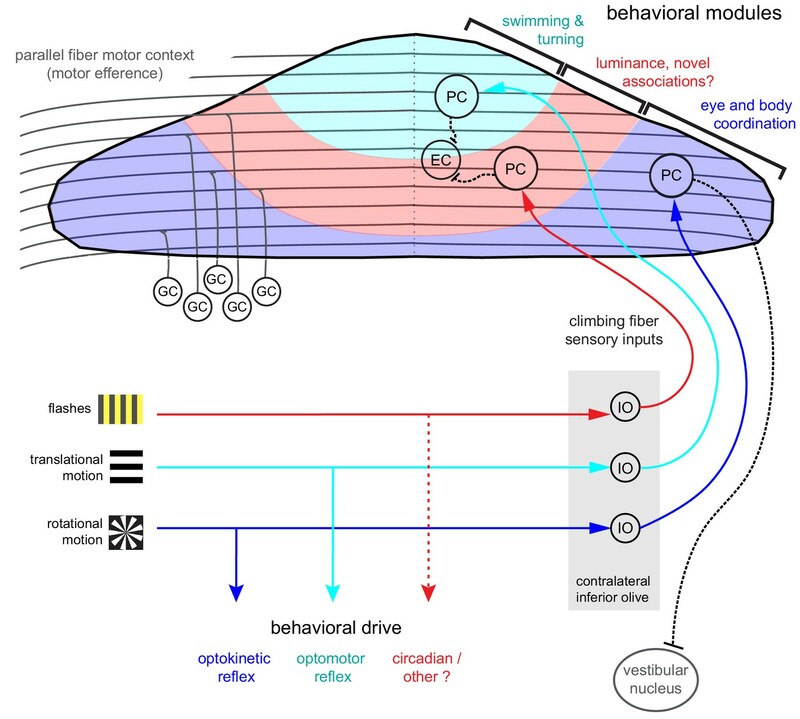 Individual regressors fall into one of five categories (four visual or one motor), as indicated by the colored bars and category names at the right, pertaining to either sensory or motor features as categorized at left. Regressors 19–21 are calculated for each cell based on the motor activity in that trial, therefore a representative example from one trial in the dataset is shown here. 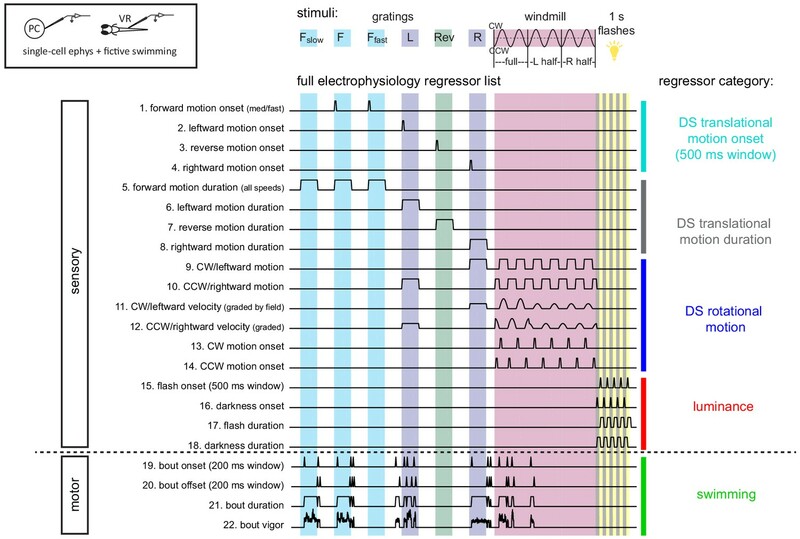 Visually-evoked swimming responses to forward gratings are episodic, vary across trials, and are clearly resolvable from visual responses. (a) Shown is the mean simple spike rate (upper trace, blue), complex spike rate (middle trace, orange), and swim bout vigor (lower trace, grey) across trials for an example fish. The compressed time scale and trial averaging suggests that visual and motor responses to forward-moving gratings may be correlated with each other as well as with both simple and complex spike rates. Multilinear analysis (summarized in text at right) finds however that the coefficient weights for motor regressors are large for simple spike activity across trials while they are zero for complex spike activity. Conversely, direction motion onset regressors for visual motion contribute to the majority of the complex spike activity and to less than 5% of simple spike activity. (b) Upper traces, the boxed area in (a) is shown on an expanded timescale and for five individual trials (numbered at left) in order to better show the temporal structure of neural and behavioral responses to visual stimuli. 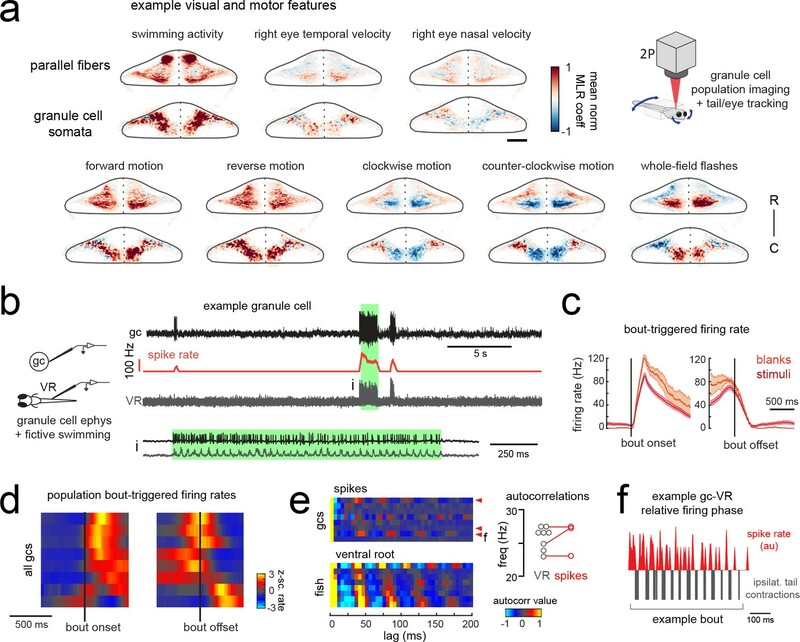 Excerpts from cell-attached recordings from this Purkinje cell (PC) and simultaneous ventral root (VR) show reliable complex spikes elicited at visual motion onset and swim bouts of varying durations and strength evoked at different latencies (up to two seconds) from visual stimulus onset. Note that trials occur where the visual stimulus can fail to elicit a complex spike (red asterisks) or a bout (purple asterisk). Lower traces, the average traces from these stimuli are also shown on an expanded timescale to drive home the point that although average activity may look correlated, the variability of visually-evoked behaviors across trials allows multilinear regression to clearly separate visual and motor responses in simple spike and complex spike activity. The forward motion onset regressor, which captures spiking responses in the 500 ms window following visual stimulus onset, is also shown for comparison. 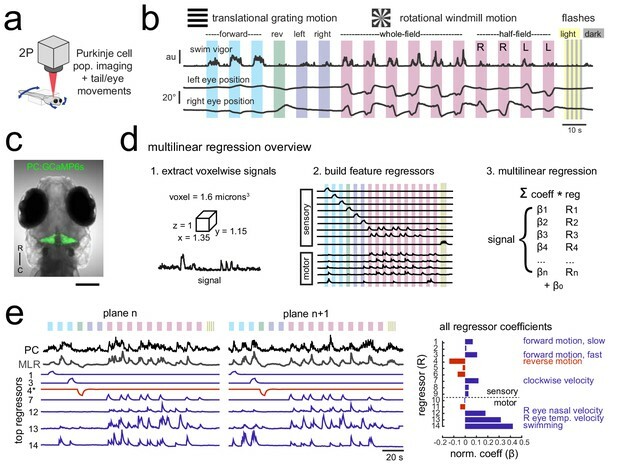 Purkinje cells in different regions show complex spike responses that encode different visual features and one group sends outputs to a different downstream region. 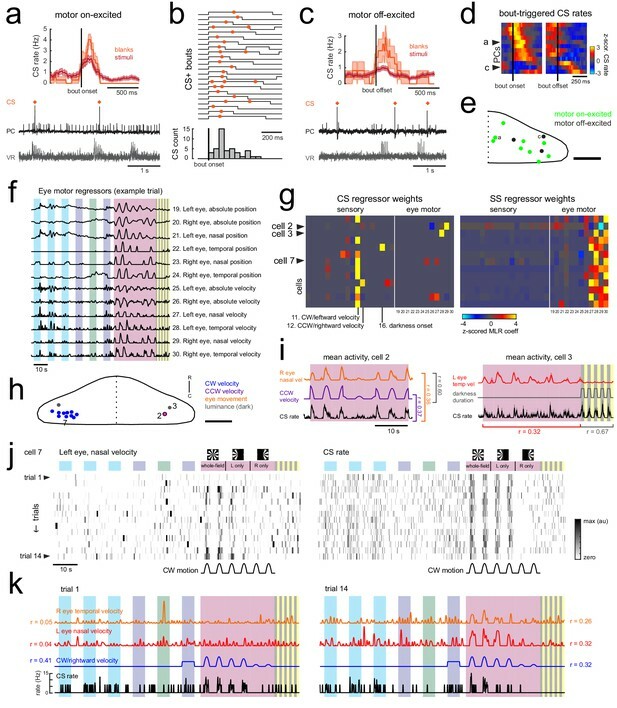 (a) Raster plot (upper left panels) and histogram (lower left panels, 500 ms bins) of complex spikes occurring across trials during translational whole-field motion of black and white bars in all four cardinal directions for two example Purkinje cells (PC). Numbers assigned to PCs for this and panels b-c are arbitrary. (b) Raster plot (upper left panels) and histogram (lower left panels, 100 ms bins) of complex spikes occurring across trials during whole- and half-field bidirectional rotational motion of a black and white windmill for an example cell. The dashed lines over the histogram show the velocity of the stimulus in each direction across the trial. (c) Raster plot (upper left panels) and histogram (lower left panels, 100 ms bins) of complex spikes occurring across trials during whole-field light/dark flashes for two example cells, (i) and ii). (d) A box plot of complex spike firing rates during blank trials (no visual stimuli) for cells grouped by their sensory or motor complex spike category (see Figure 2). N = 31, 14, 5, 8. Asterisks indicate significance (one-way ANOVA with Bonferroni post hoc correction, p<0.001). j (i) The location of cells colored by complex spike phenotype are plotted onto a flattened dorsal view of the cerebellum with all coordinates flipped to the right half of the cerebellum. e (ii) Three example maximum projection images of traced axonal morphology from stochastically-labelled, Fyn-mClover3-expressing Purkinje cells for which electrophysiological recordings were also obtained. Labels for each cell refer to the electrophysiological traces in panels a-c. The asterisk for cell a) indicates that these coordinates were flipped to the right half of the cerebellum. Scale bar = 50 microns. e (iii) Categorical grouping of complex spike phenotypes for internal versus caudal axonal projections. N = 17 cells from 17 fish. (f) Morphed Purkinje cell axonal morphologies from single-cell labelling across fish (N = 50 cells) can be grouped into two populations based on axonal projection (as for e iii). N = 27 cells with internal axons, N = 23 cells with caudal axons. See also Figure 4—figure supplement 1. Complex spike responses encode specific aspects of visual features. (a) Left, polar plot of all Purkinje cells with a significant contribution to complex spike activity from the onset of translational motion in a given direction (N = 33/61 cells). The tuning of the cells is indicated by the polar coordinates as well as the marker color, with 0° indicating forward motion. The distance from the center indicates the direction selectivity index of the cell (see Materials and methods). Dashed areas indicate the four quadrants used for binning. Right, the location of all cells with this complex spike phenotype within the quadrants are plotted onto a flattened dorsal view of the cerebellum (example cells i and ii from Figure 3a are indicated and outlined in black). The overview shows the zoomed-in region of the rostromedial cerebellum. Colors indicate tuning preference as shown at left. Dotted ellipses indicate the boundary for the mean location and SEM for each group of similarly tuned cells. Scale bar = 100 microns for overview, 500 microns for cropped zoom. (b) Upper plots, the mean complex spike firing rate (normalized to baseline, dotted black line) of all Purkinje cells with significant coefficient weights for rotational motion regressors (N = 11) is shown for both the duration of rotational motion in a given direction (left plot) and the duration of leftward and rightward translational motion (right plot). Two distinct groups are clearly seen that prefer either clockwise and rightward motion (orange lines) or counter-clockwise and leftward motion (blue lines). Lower panel, the location of all cells with this complex spike phenotype are plotted onto a flattened dorsal view of the cerebellum. Colors indicate rotational motion preference. Scale bar = 50 microns. (c) Left, all luminance-responsive cells as determined by significant autocorrelation values for whole-field flashes for the 2 s lag (N = 25/61) are plotted in a heat map sorted by maximum autocorrelation value for the 2 s lag. Cells are ordered by peak autocorrelation at 2 s. (d) Z-scored complex spike firing rates for all luminance-responsive Purkinje cells averaged across flash repetitions and sorted by the timing of their peak firing rate are shown as a heatmap. Black lines mark the transition from dark to light and back again as indicated by the grey bars above. Example cells from Figure 3c are indicated. N = 25 cells. (e) The location of all cells with a luminance complex spike phenotype are plotted onto a flattened dorsal view of the cerebellum with all coordinates flipped to the right half of the cerebellum. Colors indicate the preference for light or dark flashes (or both). Scale bar = 50 microns. (f) Four example Purkinje cell mean complex spike firing rates in response to whole-field flashes (left) and three directions of moving gratings (right) show different responses to global versus local luminance changes. (g) Additional recordings from a luminance-responsive Purkinje cell (see Figure 3cii) during the presentation of whole-field black (here shown as dark grey) and white flashes of various durations (50–5000 ms) from a baseline intermediate luminance (light grey). Upper panel, raster plot of complex spikes across trials (N = 11). Lower panel, complex spike count histogram. This cell produces has a clear sustained increase in complex spike activity during darkness whereas complex spike activity is nearly absent during bright flashes. (h) Quantification of the baseline complex spike firing rate of the cell in g) in the absence of changing visual stimuli for periods of tens of minutes for three different whole-field luminance levels. Three asterisks indicate p<0.001 and two indicate p<0.01 as calculated by one-way ANOVA with Bonferroni post hoc correction. Purkinje cell dendrites show a mostly planar morphology. (a) Four example Purkinje cell morphologies obtained by single-cell labeling (see Materials and methods) are shown with their soma and axon in black and dendrites in orange. Asterisks indicate a truncated axon. (b) Quantification of dendritic morphology as measured by determining the principal axes (see Materials and methods) shows that dendrites are significantly more planar than chance (p<0.01, Wilcoxon signed rank test). Motor-related complex spikes are rare. (a) Upper plot, the mean bout-triggered complex spike rate with shaded SEM for this cell for all swim bouts during the blank recordings (no stimuli presented, orange trace) and during trials with visual stimuli (red trace). N = 16 bouts (blanks), 76 bouts (stimuli). Lower traces, example excerpt from a blank recording from this Purkinje cell (PC, black trace) with simultaneous ventral root recording (VR, gray trace, shown as a moving standard deviation). Complex spikes are indicated by orange dots above the trace. (b) Upper traces, a subset of bouts are plotted aligned to bout onset for swim episodes during which a complex spike (orange dot) occurred. Below, a normalized histogram for all CS-positive bouts in this recording show that the majority of the complex spikes are triggered in the period 100–150 ms following bout onset (N = 34/76 CS-positive bouts). (c) Upper plot, the mean bout off-triggered complex spike rate with shaded SEM for this cell for blank and visual stimuli trials. N = 12 bouts (blanks), 468 bouts (stimuli). Lower traces, example excerpt from a blank electrophysiological recording from this cell. (d) Heatmap of bout on- and off-triggered mean complex spike rates for all cells with significant motor coefficients arranged by peak CS firing rate from bout onset. The lower three rows correspond to cells that have a decrease in CS activity during bouts which increases following bout offset. The example cells from a) and c) are indicated. (e) The locations of these Purkinje cells with CS activity correlated with bout onset (green) or bout offset (black) are plotted on the right lobe of a reference cerebellum (some coordinates were flipped from left to right). The example cells from a) and c) are indicated. Scale bar = 50 microns. 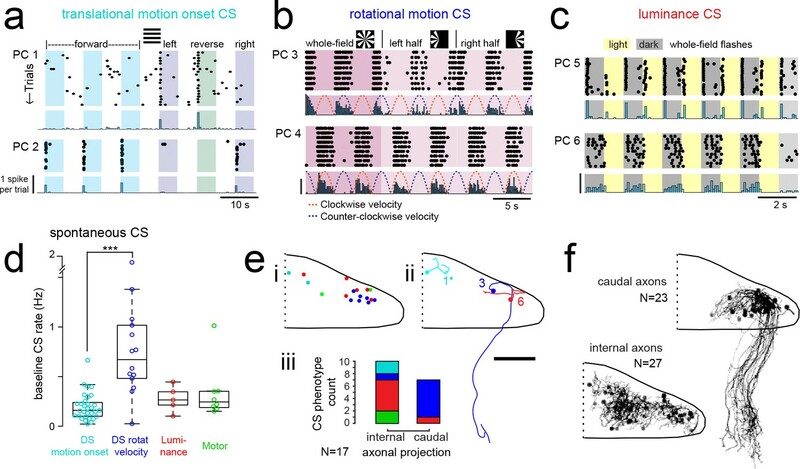 (f) The 12 eye motor regressors used for multilinear least squares regression (MLR) of electrophysiological data with eye movements in the semi-paralyzed zebrafish (see Materials and methods for details; see Figure 1—figure supplement 2 for the description of sensory regressors). All eye motor regressors are calculated for each cell based on the motor activity of each eye (tracked independently) in that trial. A representative set of regressors computed from eye movement in one trial in the dataset is shown here. (g) Heatmap of all 30 regressor coefficient weights (18 sensory and 12 eye motor) for the complex spike (left) and simple spike (right) firing rates of 13 cells (N = 11 fish). The sensory regressors with the largest coefficient weights for complex spike rates are indicated. For complex spike phenotypes, 11/13 Purkinje cells have a stronger ‘sensory’ phenotype, whereas 13/13 Purkinje cell have a simple spike ‘motor’ phenotype. The two remaining Purkinje cells with a motor complex spike phenotype are indicated as ci and cii (arrowheads). (h) Location of all cells, color-coded for complex spike phenotype as determined by MLR and additional analyses (see subsequent panels). Scale bar = 50 microns. 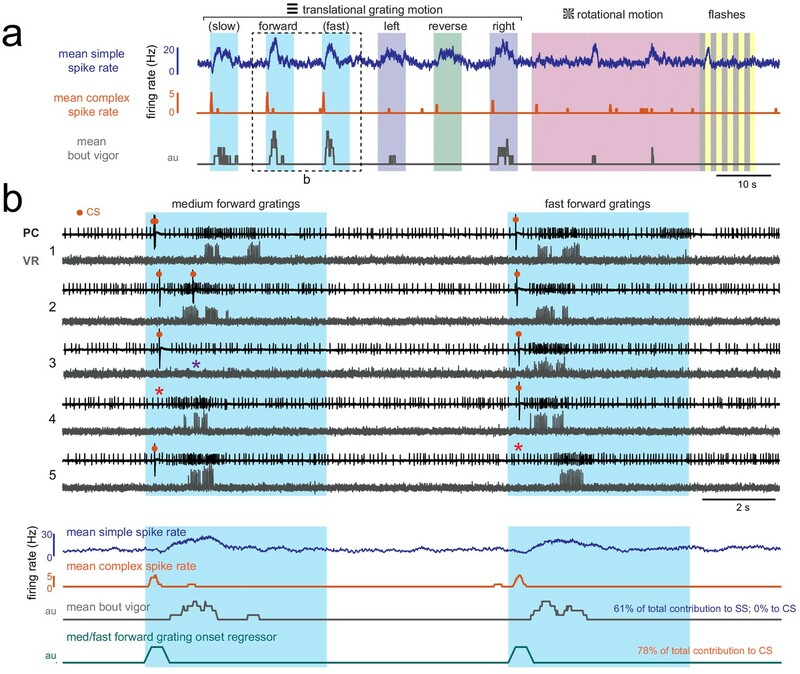 (i) Left, mean activity and SEM for the complex spike rate and best eye movement regressor excerpted from the rotational stimulus portion of the experiment for Purkinje cell two as indicated in g) and classified as having a motor complex spike phenotype. The single correlation coefficient between the best motor and sensory regressors across trials are very high (r = 0.60 across the full trial). Right, mean activity and SEM for the complex spike rate and best eye movement regressor excerpted from the rotational stimulus and flash portion of the experiment for Purkinje cell three as indicated in b) and the only other cell classified as having a ‘motor’ complex spike phenotype. The single correlation coefficient values for the complex spike rate with the indicated regressors across trials for just the rotational stimulus period or just the luminance period are shown. (j) Heatmap of eye movement (left eye, nasal) and complex spike rates across all trials of an experiment for a representative Purkinje cell in the left caudolateral cerebellum (cell seven as indicated in g,h). Note the variability of the eye movement across trials (left) compared to the complex spike rate (right). Clockwise velocity is indicated for reference. (k) The best motor regressors for each eye and the best sensory regressor are plotted against the complex spike rate of the cell in j) for the first (left) and last (right) trial of the experiment. Single correlation coefficient values are shown between each regressor and the complex spike rate for this trial. Time scale is same as for j). Simple spike rates in most Purkinje cells are increased during fictive swimming. (a) Above, heatmap of coefficient weights for the simple spike firing rates of 61 cells from least-squares regression with a full set of 24 stimulus- and motor-related variables (see Materials and methods for more details). Below, histogram showing the distribution of cells’ highest regressor weight and the associated sensory/motor categories. (b) Upper panel, heatmap of z-scored simple spike rates for all 61 cells sorted by decreasing motor coefficient weight. Lower panel, the mean simple spike rate for the ten cells with the highest (upper trace) and lowest (lower trace) motor coefficient weights. (c) Left panel, example cell-attached Purkinje cell recording (PC, upper trace, black) from a blank trial (no stimuli) with simultaneous ventral root recording (VR, lower trace, gray, shown as a moving standard deviation). The simple spike rate is also shown (SSrate, middle trace, purple). Right, the bouts highlighted in green on an expanded timescale show the close timing of fictive bout onset and simple spike activity. (d) The bout on- and off-triggered mean simple spike firing rates for the cell in c) during blank recordings (purple) and stimulus trials (pink). (e) Z-scored heatmap of bout on- and off-triggered mean simple spike firing rates across all Purkinje cells sorted by mean firing rate in the 300 ms following bout onset. (f) Mean autocorrelation heatmap for simple spikes (SS, upper panel) and for ventral root recordings (VR, lower panel) for all Purkinje cells that showed spontaneous swimming bouts during blank trials (N = 30 cells from 30 fish), sorted by time to first peak in the VR autocorrelation. Right, the first significant peak in the VR autocorrelation for each recording is plotted to give the mean fictive swim frequency for each fish. Granule cells across the cerebellum code for motor activity with high fidelity. (a) Heatmaps of the z-projected mean voxelwise correlation coefficients of two-photon granule cell GCaMP6s signals from multilinear regression with example sensory and motor regressors averaged across seven fish (see Materials and methods). Scale bar = 50 microns. Upper right, cartoon of experimental set-up. (b) Left, cartoon of experimental set-up. Right, upper panel, example cell-attached recording from a granule cell (gc, upper trace, black) from a blank trial with simultaneous ventral root recording (VR, lower trace, gray). The granule cell firing rate is also shown (spike rate, middle trace, orange). The bout highlighted in green (i) is shown below on an expanded timescale. (c) The bout on- (left) and off- (right) triggered mean firing rates for this granule cell during blank recordings (orange) and stimulus trials (red). (d) Z-scored heatmaps of bout on- (left) and off- (right) triggered mean firing rates in all granule cells sorted by mean firing rate in the 300 ms following bout onset (N = 8 cells from eight fish). (e) Mean autocorrelation heatmap for spikes (upper panel) and ventral root recordings (VR, lower panel) for all granule cells from d), sorted by time to first peak in the VR autocorrelation. The red arrowheads signify granule cells with significant spike autocorrelations during fictive swim bouts (N = 3; p<0.001, Ljung-Box Q-test; see Materials and methods). Right, the first significant peak in the VR autocorrelation for each recording is plotted to give the mean fictive swim frequency for each fish. The red circles are the mean spike autocorrelation frequency obtained from the three significantly autocorrelated granule cells. (f) An example bout from the cell indicated in e), which was located ipsilateral to the ventral root recording. The smoothed spike rate (red) is in antiphase with the ipsilateral fictive tail contractions (grey). See also Figure 6—figure supplement 1. Many granule cells show significant modulation of their firing rates during fictive swimming bouts. 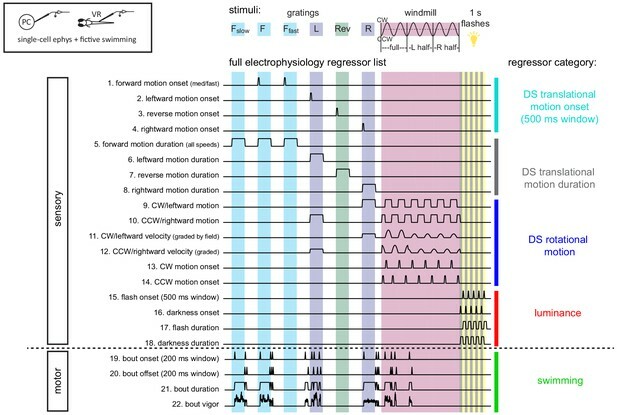 (a) Left, matrix of multilinear regressor coefficients for granule cell firing rates from all 10 cell-attached electrophysiological recordings with simultaneous fictive behavior in response to the same sensory stimuli as shown in Figure 2a. Right, histogram of cell counts for each best regressor category (as color-coded at left). (b) Location of granule cells across all fish mapped onto a reference cerebellum (dorsal view) and colored according to their motor phenotype. All coordinates are flipped onto the right hemisphere. Scale bar = 50 microns. (c) Left, heatmap of z-scored mean firing rates for all granule cells sorted by decreasing motor regressor coefficient. Colored bars at right indicate cells whose firing rate is positively modulated by bout duration (green), by bout offset (black), or by neither (grey). Right, cluster mean granule cell firing rates (black) and mean fictive bout vigor (grey). Purkinje cells modify their simple spike output in a complex spike- and motor context-dependent way. (a) Heatmap of complex spike-driven simple spike (CS:SS) counts for each cell normalized to the mean over 100 ms preceding a complex spike. Cells are sorted by decreasing simple spike pause and increasing excitation. The inset shows the location of these cells colored by the normalized difference in simple spiking in the 50 ms following the CS. (b) The mean complex spike-triggered simple spike count (10 ms bins) is shown for five example cells (as indicated in a) for five different contexts. Left (green box), in the presence (‘motor’) versus absence (‘non-motor’) of fictive swimming episodes. Under non-motor conditions these different Purkinje cells show, respectively, a CS-induced i) long SS pause, ii) short SS pause with rebound increase, iii) no change in SS, iv) short SS increase, and finally a v) long SS increase. Green arrows highlight changed patterns during motor context. Middle (magenta box), CS:SS relationships across preferred versus all other sensory contexts (only non-motor periods included). Right (grey box), the CS:SS relationship during blank trials (no stimuli, only non-motor periods). Vertical scale bar indicates the rate conversion for 0.2 spikes/10 ms bin (20 Hz). (c) Green markers show the mean normalized simple spike rates (calculated from 10 ms bins) for all Purkinje cells centered on the occurrence of a complex spike during a fictive bout minus those occurring at any other point (N = 51 cells). Data are mean ± SEM. Grey markers, simple spike rates centered on the occurrence of a complex spike during all sensory stimuli minus those occurring during blank trials (N = 53 cells). The dashed black line indicates zero difference between conditions. Inset, the window around complex spike onset shown on an expanded timescale. Asterisks indicate p<0.05 for motor minus nonmotor conditions (green markers) as computed by the Wilcoxon signed rank test. Grey markers, no significant differences. (d) Heat maps are shown for individual Purkinje cell binned simple spike counts over the three different 50 ms periods as indicated in e). Complex-spike triggered simple spike counts are separated for each cell for those complex spikes occurring during a fictive bout (left column of heatmaps, outlined in green) or at any other time (right column of heatmaps, outlined in black). Individual Purkinje cells preferentially combine sensory and motor information. (a) The mean fraction of the simple spike (SS) response contributed by each regressor computed for each of the four Purkinje cell complex spike (CS) groups. (b) Left, scatterplot of the fraction of complex spike versus simple spike activity accounted for by motor regressors. Right, the fraction of simple spike activity accounted for by motor regressors versus the fraction of complex spike activity accounted for by all sensory regressors. 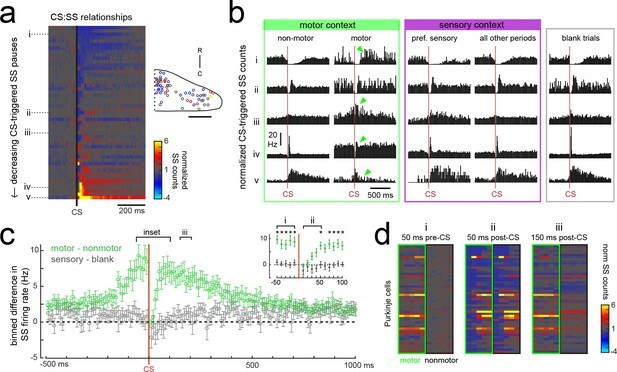 Organization of the larval zebrafish cerebellum Granule cells (GCs) send long parallel fibers (grey lines) that contact Purkinje cells (PCs) across the cerebellum and broadly relay motor efference copies of locomotor activity (swimming). Sensory information relating to different visual features are sent by climbing fibers of inferior olive neurons (IO) to stereotyped regions of the contralateral Purkinje cell layer. These visual stimuli contribute to several reflexive behaviors; rotational motion drives the optokinetic reflex of the eyes, translational forward motion drives the optomotor swimming reflex while others, such as luminance, may drive behavior over longer (e.g. circadian) timescales. 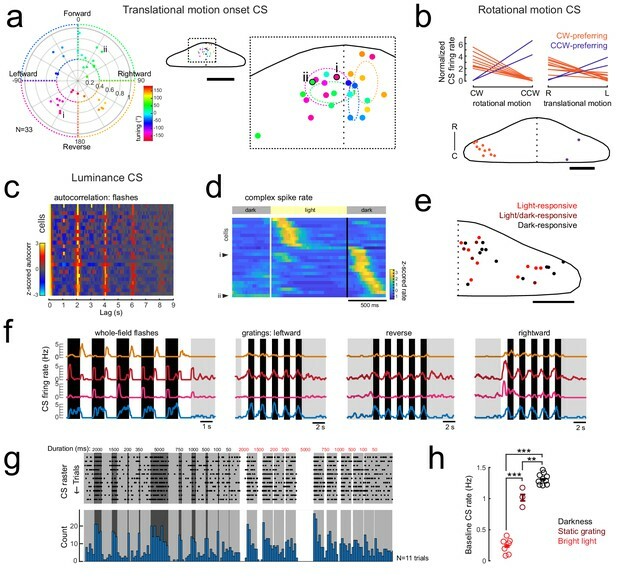 The three distinct functional regions in the zebrafish cerebellum defined by Purkinje cell complex spike sensory responses that encode these different visual features represent putative behavioral modules. Information about the onset of directional translational motion is preferentially sent to PCs in the rostromedial region of the cerebellum (cyan) and would be important for coordinating turning and swimming, while information about the direction and velocity of rotational motion as would be needed for coordinating eye and body movements is sent to the caudolateral region (blue). The central region (red) receives information about luminance and may provide a substrate for learned sensorimotor associations. Axons from PCs (black dashed lines) of the rostromedial and central regions have mostly internal axons that contact eurydendroid cells (EC) within the cerebellar cortex. Axons from PCs in the caudolateral region have mostly external axons that exit the cerebellum and contact neurons in the caudally-located ipsilateral vestibular nucleus. Z-projection map of GCaMP6s responses (max dF/F) in Purkinje cells to visual stimuli. Single plane at −35 microns depth from the dorsal surface showing GCaMP6s responses (max dF/F) in Purkinje cells to visual stimuli. Upper left, anatomical stack of Purkinje cell anatomy (upper left) showing the depth in microns of the plane from the dorsal surface. Other panels, the corresponding plane from the stack of regressor coefficient weights (labelled for regressor type) for all Purkinje cells as quantified with multilinear regression (see Materials and methods). Related to Figure 2. Example electrophysiological datasets are available at https://zenodo.org/record/1494071. An example imaging dataset is available at https://zenodo.org/record/1638807. 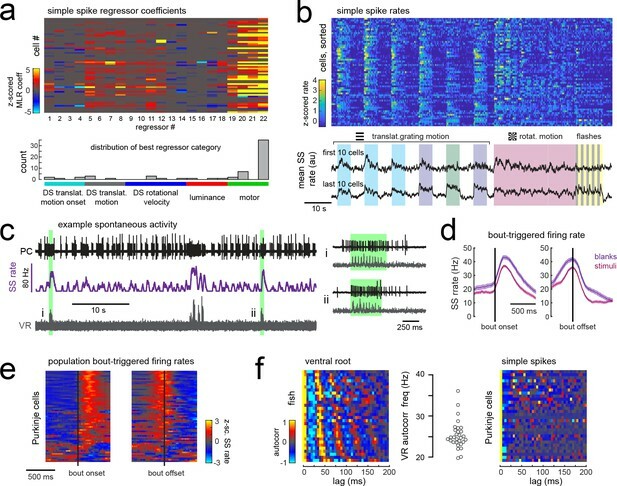 MATLAB code for electrophysiological analysis available via GitHub (https://github.com/portugueslab/Knogler_etal_2019_eLife; copy archived athttps://github.com/elifesciences-publications/Knogler_etal_2019_eLife).